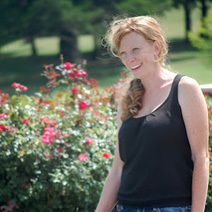 Heather Parrott standing near the house and gardens of a modern estate in north Edmond. The organic herb garden off the kitchen is adjacent to the pool and and modern-style seating area. A plant-like sculpture mimics the grasses and other plants in the back of the house. The park-like front lawn is surrounded by the the woods and watched over by a lounging woman. Parrott standing in the pool area of the second more traditional home. You are greeted by marigolds and spiral junipers in the sunny front of the house. 'Knock Out Roses and potted annuals brighten the pool area over-looking the pond. The beds are full of Angelonia and Pentas-both of which can withstand the full Oklahoma sun. Parrott with some students from KIPP Reach College Preparatory school who assisted in planting some flower beds for the OKC Festival of the Arts. Being newly married with eight children would be as good an excuse as any to take a break and rest on her laurels, but master gardener, Heather Parrott just keeps doing what she does best: creating and maintaining beautiful gardens and outdoor spaces in Oklahoma. Soft-spoken, reserved and feminine, most would not peg Heather Parrott as the type that likes to keep her hands in the dirt. Although she earned a bachelor’s degree in psychology, she minored in horticulture. “It turns out I like plants more than people,” she quipped. In addition to her training through the OSU Extension’s Master Gardner program, Parrott has been in business 7 years as the owner of a local, full service landscape design and maintenance company, Neighborhood Gardener. This has given her ample opportunity to learn to deal with what she calls Oklahoma’s “bi-polar weather”, which limits landscape design options in Oklahoma City. Oklahoma County is located in temperature zone 7a; with the lowest average temperature at 10 degrees Fahrenheit and the highest at 95 degrees Fahrenheit. An 85 degree temperature swing in a year is typically a gardener’s worst nightmare. For Parrott, it’s a challenge she’s met head-on with some stunningly beautiful results. In between ballet lessons and graduations, Parrott carved out some time to give ionOKlahoma a tour of two estates in north Edmond for which she provides landscape design and maintenance; each one with its own feel and challenges. Each space requiring a balancing act; one between the owner’s tastes, environmental factors and maintenance issues. The first home we toured is hidden from the main thoroughfare, down a winding gravel road into a heavily wooded area. The one-of-a-kind, modern house hidden among the tree is the true master of the space, and the low-key, non-traditional landscaping and gardens compliment, instead of compete with, the man-made structures. A park-like feel has been created in the front, with the green lawn and shade trees lined by the forest. In the back, quietly beckoning next to the herb garden, is a small lap pool. Modern sculptures are dispensed in and amongst the perennial grasses and modern-style seating area. “Every visual perspective is maintained and intentionally created,” said Parrot. She has created a particular feel to the forest, one that requires as much regular maintenance as the more manicured parts of the landscape. The bottom branches of the trees are kept trimmed back and the brush cleared so the beauty of the larger trees is more prominent. The property is also maintained organically. Parrott uses corn gluten meal as fertilize and pre-emergent, tea compost as weed control and soil amendment, and a high-concentrate vinegar solution for pest control. Trimming around the herb garden must be done by hand. “I didn’t see the effects of the [organic] pre-emergent until the third year, because it needed time to wean off of the synthetic-a detoxification,” she said. The homeowner is a gourmet cook and wanted an organic herb garden near the kitchen. When Parrot first began working on the property seven years ago, the herb garden was proving to be a challenge; nothing would grow in the location they had chosen for the garden. Parrott discovered black walnut trees to be the source of the problem. These trees naturally secrete a chemical called juglone, which stunts the growth of other plants. Her solution was to replace the first three feet of soil in the herb bed in addition to finding plants suitable to the area. Perennial herbs are especially immune to environmental problems and are resistant to juglone. The herb garden is now lush and healthy. There, one can find more than an armful of aromatic perennials and other edibles: sage, rosemary, thyme, peppermint, chives, strawberries, pineapple sage, and daylilies (all are edible, but some have better flavor than others). Annual favorites, basil and fennel, are also thriving. “You need to look at the whole environment, and come up with a plan for plants that are most adaptable to the area,” said Parrott. The second estate, also in north Edmond, had a more traditional feel. The front of the property greeted us with marigolds and ribbon grass, both of which love the full sun. Parrott used the globe-like African marigolds this year instead of their French counterpart: the French marigolds proved to be too delicate for the over-bearing heat last summer. An old-fashioned annual, marigolds deter pests in the garden and provide continuous, vibrant color in the throes of summer. Following her own advice, she also planted spiral junipers and blue cedar in the sunny front of the home, both of which are drought tolerant. The large back patio, where there is a generous swimming pool and a beautiful view of the pond and grounds, is heavily planted with potted tropical flowers. Drip irrigation is used in all the pots and beds. For color in the patio flowerbeds, she used a heaping helping of Pentas and Angelonia, both of which thrive in the summer heat. The ‘Knock Out’ Roses are kept the height of the wrought iron fence surrounding the pool area; all of which directs the eye to the pond and park-like green space beyond. While beautiful, the pond and the “park” surrounding it need constant attention. The pond was home to a beaver family last year, which required Parrott to wrap the trees with chain-link fence and hire someone to relocate the animals. To create the park feel to the green space, she keeps the lower tree branches trimmed, the brush cleared and the grass mowed. But this busy beaver is not just “all business.” As a master gardener, she gives back to the community by volunteering a minimum of 20 hours each year-an amount she easily surpasses. She fulfills some of these hours by offering free demonstrations at Minick Materials – her most recent demonstrations include how to build a fire pit and creating custom container gardens – in addition to providing the voice and brain behind the “Garden Minute” on The Spy radio station. Notice all the gorgeous flowers and landscaping at the Oklahoma City Festival of the Arts this year? Parrott and a handful of local teens made it happen. As the landscape chair for the state’s largest arts festival, through the Arts Council of Oklahoma City, she partnered with the Junior League to provide programming to 25 local middle school students from KIPP Reach College Preparatory school. Parrott provided hands-on training for the students: they chose the plant material, learned the culture and growth habit of the plants and planted them in four beds throughout the festival grounds in downtown Oklahoma City, a project she clearly relished. It’s said you can’t judge a book – or people – by their appearance, and sometimes you can’t even judge them by their words. With that said, if you hear Heather Parrott saying she likes plants better than people…tell her you know better.